Learn important tips and tricks of making Railway Reservation and booking Tatkal Railway Tickets using IRCTC LOGIN and save those few precious seconds which will increase the chances of getting confirmed train ticket. Booking Tatkal ticket is like winning a lottery. However, with proper time management and good techniques, we can increase the chances of booking a Tatkal ticket substantially. Before we come to the actual process of booking, we must keep the following points in mind. Login to IRCTC account well before time, probably 5 to 10 minutes before actual start of booking time. Please note that w.e.f. 15.06.2015, booking for AC Tatkal tickets starts at 10:00 a.m. and for non-AC, it starts at 11:00 a.m. To start with, you must be familiar with Indian Railways train reservation process. For this please follow INDIAN RAILWAYS NORMAL & TATKAL TICKET BOOKING. You can make your login even more faster by using "Remember My Password" facility of Google Chrome browser or any other browser. To use this facility, you have to delete saved password from Google Chrome. To do so, click on the three horizontal lines shown at the top right corner of the screen as shown in the following diagram. 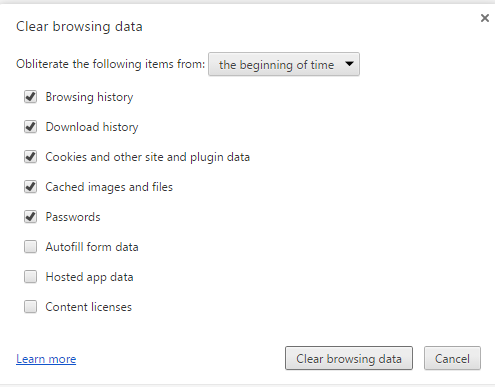 Bring the cursor over "More tools" option and then click "Clear browsing data". A part of the screen which follows is shown below. 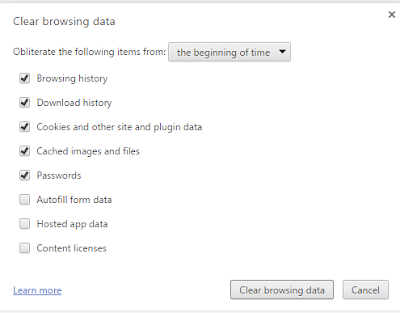 Tick on "Passwords" option, select "the beginning of time", and click on "Clear browsing data". Your saved passwords will be deleted from Chrome. Now login to your IRCTC account in a normal way. When Chrome says "Save password for this website", click "yes". When you login to IRCTC next time, your login ID and password will already be filled and you will need to enter only the captcha characters. In other words, one can login to IRCTC without entering login ID and password. Amazing !, isn't it ? Never click "Back" option of your browser, otherwise you will be logged out by IRCTC. Do not keep IRCTC screen idle for more than 2 to 3 minutes, otherwise you will be logged out. To overcome this problem, on "Plan My Journey/ Quick Book" page, you can click "Submit" and "Replan/ Reset" options alternately till the start of actual booking time. Please note that Quick Book option is not available during Tatkal booking. However, you can use Favourite Journey List and Travel List options. Do not make too many enquiries (not more than 10) about seat/ berth availability in various trains otherwise you will be logged out. It is better to be certain beforehand about the train and class of travel in which the Tatkal ticket is to be booked. Maximum 4 passengers can be booked on a single Tatkal ticket against a PNR. Maximum two different bookings can be made from one account. However, you can make only one booking in one user login session except for return/ onward journey between 08:00 a.m. to 12:00 p.m. To make another booking, you have to logout and then login again. Be careful about captcha characters. These become more difficult to recognise at the beginning of Tatkal booking time. If you are not certain, click circular refresh button to get a new set of captcha characters. You can also use the "Zoom" facility of your browser to increase the size of the captcha characters to make them more clearer. For further details about captcha problem, please follow IRCTC CAPTCHA PROBLEM AND ITS SOLUTION. It is always better to have high speed internet connection, preferably 2 Mbps, as speed does matter. However, if your speed is even 512 Kbps, don't get disheartened, you can even try at this speed. Along with good internet speed, your computer should have good Processor speed and enough RAM, probably not less than 2 GB. Close all other websites (Gmail, Facebook, Twitter etc.) and other programmes running on the computer during ticket booking. This will free all the internet speed and computer RAM for IRCTC website. If requirement of ticket is very urgent then go for Second AC (2A) where there is less competition due to high cost, even though it has less number of berths than Third AC (3A) or Sleeper (SL) class. Make payment using Debit Card as this will eliminate the need to login to your bank account. Also, there will be no need of confirmation through One Time Password (OTP) received on your mobile. To enter the long Card number, put it on Note Pad and quickly copy paste to IRCTC website. Login to your IRCTC account and select "Plan My Journey" option as you cannot select "Quick Book" option during Tatkal ticket booking. Automatically enter the names of starting station, destination station, and E-ticket option by clicking on "Select Favourite Journey List". You have to enter the travel date manually. To know how to prepare "Favourite Journey List" and "Travel List", please visitFASTER BOOKING OF INDIAN RAIL TICKETS USING IRCTC LOGIN. After entering the journey date manually, hit the "Submit" button quickly. A new screen will appear where all the possible trains will be listed. As soon as it is 10:00 a.m. for AC Tatkal and 11:00 a.m. for non-AC Tatkal, check Tatkal option shown at the top of the list of the trains. Now click on desired Class of selected train at the extreme right of the list of trains. Availability of seats will now be shown. If seats are available, quickly click "Book Now". You will be taken to a new window where you can fill the details about all the passengers. A part of the screen is shown below. Here comes the roll of your "Travel List". Quickly click on "Select Your Travel List". All the travel lists made by you will be shown. Select the desired travel list. As soon as you select the desired travel list, the details of the passengers will be filled in the above form, including card type and its ID number. Now, quickly fill the captcha characters and click "Next" to make the payment using desired method of payment. The roll of Magic Autofill comes only after you have done all the initial hard work and fortunately reached the screen where passenger details are to be filled, as shown in the above diagram. If you have not accomplished this, Magic Autofill cannot help you in any way. Moreover, it is a third party utility which may not work properly. Go to Magic Autofill website and click on "Reservation Form" option. Fill all the information about the passengers in the reservation form. Click on " I am feeling Lucky" button given at the bottom of the reservation form. The following screen will appear. 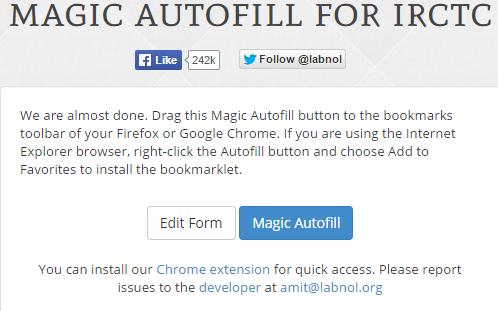 You have to take the Magic Autofill to the bookmarks toolbar as detailed in the above image. Firefox and Google Chrome users should bring the cursor on Magic Autofill button, click the left button of mouse and drag it to the bookmarks toolbar. Now when you reach the IRCTC screen for filling the passengers details, just click the Magic Autofill button on the bookmarks toolbar. All the details will automatically be filled in the IRCTC for. Now you can proceed for payment in usual manner. As already mentioned, my preferred method of payment is through Debit Cards. At present, the debit cards of the following banks can be used. Please remember that if you have debit card of any other bank, then you must select "Payment Gateway/ Credit Card" option to make payment using the debit card of the banks not listed above. One problem in making payment through Debit Cards is the long card number which must be entered. This problem can be solved by opening two minimized windows side by side as shown in the following diagram. One window is the IRCTC payment page and other window is of Notepad. These windows can be created by clicking on "Restore Down" button given at the top right corners of the original windows and then dragging the four sides of the window inward. Now you can type the 19 digit card number, name of payee on Notepad and copy paste it on the IRCTC payment page shown at the left. Please note that side by side window setting should be done before the actual booking starts. Keep the IRCTC window to full till you reach the payment stage. You should pin the Notepad to the Taskbar for its easy access. Taskbar is the strip at the bottom of the window. 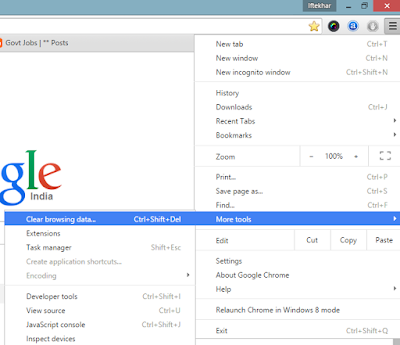 Same thing can also be achieved even without side by side windows. For this, when you reach at the payment stage, click on Notepad icon pinned to the Taskbar. Notepad window will open over the IRCTC window. 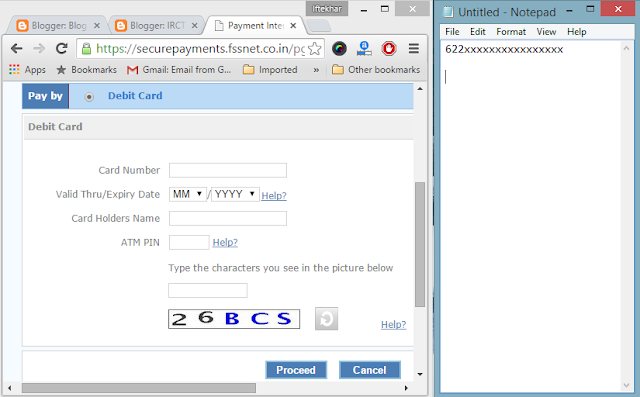 Copy the card number from Notepad, click the IRCTC window and paste the card number on it. 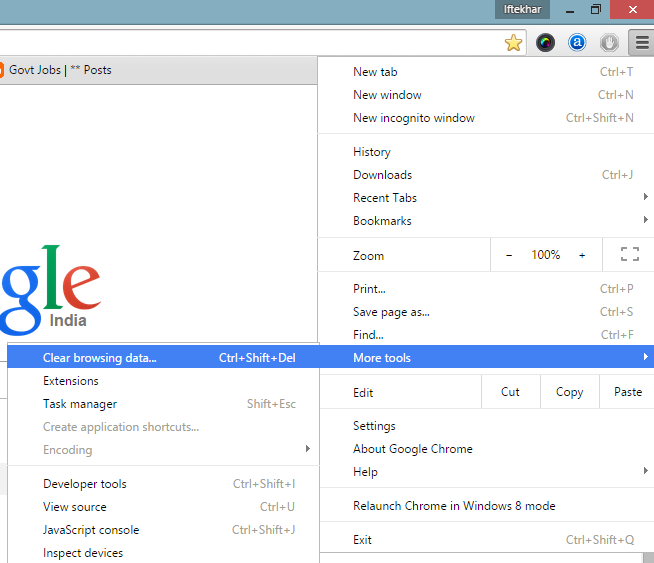 As soon as you click on IRCTC window, the Notepad will be minimized to the Taskbar again. Please keep the size of Notepad window much smaller than IRCTC window. Last but not the least, every one needs a bit of luck to accomplish any task. To get Tatkal ticket in Indian Railways, we need to be more lucky than that.